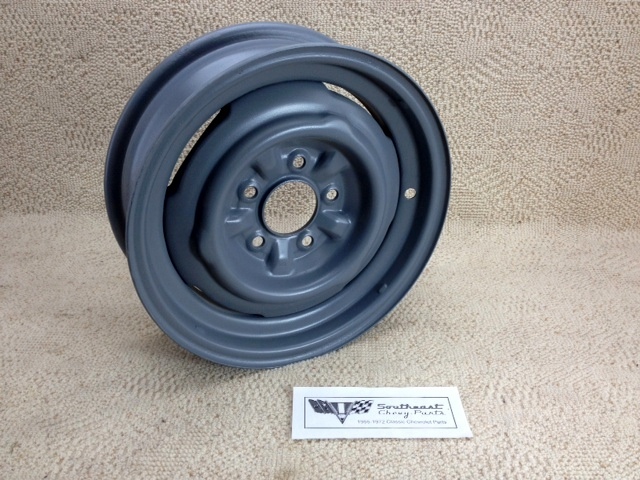 This 1955-1956 Chevrolet Bel Air passenger car 15 x 5 wheel is an original GM part. The wheel contains the four "nubs" in order to attach the original hubcap. 1955 and early 1956 had a riveted two piece wheel (see photo). But most of the 1956 wheels were welded two piece wheels. GM decided to make to weld the pieces together for fewer leaks and reduced production costs. A: The wheels are original GM wheels. Some may have the Kelsey Hayes mark. Some of the wheels have the rubber inserts in the slots. The best way to assist you is to have you call the shop and speak with one of our parts specialists.